old-growth saw timber. Second-growth saw timber comprised nearly 25 percent. 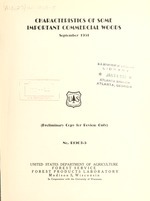 the general forest types in the United States is shovn in figure 1.
resources of the United States. these two states, it is the most abundant commercial hardwood species. but it is also used for sash, doors, and millwork. grows along the Pacific coast. lands. Black ash is important commercially in the Lake States. Plains produced some ash lumber. wood. Jld-growrth trees with a small proportion of sapwood are scarce. colored; wood of such trees is narrow,-ringed. percent moisture content ill assure excellent material. nd Plywood, PolGs nd is,' rest Service, U. S. Dept. of Agric., 1950.
veneer. Trees *f inferior grade are used for railway ties and for fuel. rcducti n of aspuen lumber in the Aocky IMountain States. i: ex,. r' nood o in dryint, partir a.;1 .: :roat*.iu"
(Tilia heterophylla). Other species occur in only very small quantities. basswood are linden, finn, and beetree. percent of the commercial production. large; however, basswood stays in place well and does not wiarp while in use. wood. Basswood in the better grades is becoming scarce and high-priced. beech" to the lighter-colored heartwood. Michigan and the New England States. between heartwood and sapood. Sapwood may be 3 to 5 inches in thiclmkness. S.cti n of charcoai, acetic acid, ,Ct,.,nl1, and other products. ulifL L), nd u -etrn p r -ra (2etla verifer v-ir, ccidentalis). Yellow birch hs white sa -I*:od and light reddish-brmn hr rt. ; -od. .:. ot birca. U a 1bit-colored: ... :. nd dark-tbr3..: hcartw::Gd t .:.-01:.itn red. ... d~. -r,., h~rt, od i wth red. 1 .. 1 .. 1: n tar r ..: 0. d eay. t'in-, :. d i' i fin *. ..in. :i. r: U.
grades supply crossties and wood for distillation, fuel'. and paper pulp. and doors. Birch veneer goes into plywood used in airplane construction. bark and trigs of sweet birch, is used as a flavoring. is lighter in color. It has moderately small shrinkage. distinctive flavor and are used by candy manufacturers. and has the reputation of being comparatively free from checking or warping. w denware novelties, pat terns, and paneling in buildings and railJay co aches. quantities from the New Eniland States southward alone the Appalachia. mntain sections of Virginia, West Virinia, North Carolina, Kentucky. of dead trees a long time after they were killed by th: blight. C ttonwood is a name applied to several species of the aenus Populus. Most important are eastern cottonwood (Populus deltoides and varieties), Ls. b In c tollr A). elevatins aion river bobtoms and and bars. narrow. It is not clearly defined and merges gradually with the heartwood. Growth rings are inconspicuous but can be distinguished on smooth surfaces. Tne wood is comparatively uniform in texture and generally straight-grained. It has a characteristic sour odor when moist but is odorless when well seasoned. that tension wood is largely responsible for this characteristic. The sapwood is nearly white, and the heartwood is brownish yellow. shrinks only a little more than yellow-poplar. mill ork, and venetian blinds. the ulf, except in southern Florida. It extends westward to eastern Texas. bcing s t >on1aat in the central Llississippi Valley. except in slippery elm where it rarely exceeds one-half inch in thickness. about equal to rock elm in weight. No data are available for September elm. of these three species have excellent bending qualities. percent of the cut came from the middle Atlantic States. are preferrel. Elm is used to a great extent for crating heavy articles. i, the furniture industry, it is especially adapted for bent parts of chairs. El:v enoer is used for fruit, vegetable, and cheese boxes, and for baskets. and is not separated in the trade. are distinct. The wood resembles elm in structure. Louisiana, and in scattered areas in other Scuthern States. recommended for use in pallets. is known by several other common names. distinction should be made between sapwood and heartw~ood having the same Ymight. percent moisture content and to have not more than 17 annual rings per inch. stiff' hickory gives a clear ringing tone under this test. used in the tool-handle industry for axe, pick, sledge, and harmer handles. rods of various sizes and dimensions, la:.-i furniture, and vell pumnps. Because of its high density, hickory is one of the best fuel woods. in Tennessee, Kentucky, West Virginia, and Virginia. species are of little commercial importance. is very heavy, averaging 48 pounds per cubic foot at 12-percent moisture content. leaved maple; and oigleaf maple as Oregon maple. Pacific coast of Jashington, Oregon, and California. C:,ft maples and hard maples in strength properties. i. it..le for fl orin; because of its hardness and resistance to abrasion. sourcoc oL' miolc su ar. and North Carolina. It is the most important lumber tree of the red oak group. portions of New York, Vermont, New Hampshire, and Maine. coasts, and in the Eississippi Valley region. vania and Virginia to the Atlantic coast. Valley region from M issouri southward, and from Alabama to Texas. westward to the Great Plains. United States from New- Jersey to Miissouri, Arkansas, and Texas. Gulf States from IvIaryland to Texas. and Julf Coastal Plains from iaryland to Louisiana. Gulf coasts and in the lower M ississippi Valley region. and quantity of both red and white oak groups. at 12-*erce:t :a 1st re c o.t:. t tu :ore b1 e l-g abou t .:< ::ds. .:. r :t ..r. 1::e red 7s fairly large s.rinkae in dr i,. .L.u.e It is .lso used in c o:structi n f railro d calrs and bots. _ziacd. [.t:,:a an v..':t,;ardct tao~ (]rea' ia>.z:s.
:, : .< t, ':: d 0 Tur-s l .:.. : -t :. .- 1- in :0 t e .<" ;" 1 1 ". except for the atlantic Coastal Plain and the Florida peninsula. through the liew England, 1iiddle tlantic, and Central States to the Great Plains. States, including the southern Appalachian area. of the absence of tyloses in many of the pores. be somewhat more decay resistant than that of the red oaks. are southern magnolia (Mag:.olia grandiflora), and sweetbay (Magnolia virginiana). sometimes also applied to sweetbay. yellow-poplar from which it can be separated only by careful examination. weighss 35 pounds per cubic foot. boxes, venetian blinds, sash, doors, veneer, and millwork. is cut from the heartwood. southward to the Gulf, except in the lower half of the Florida Peninsula. the latter writh 13 percent of the lumber cut in 1947.
resistance. Sweetgum is classed with wood of intermediate durability. for boxes, crates, baskets, and interior wood work. 33 percent and the South Atlantic States about 9 percent. seasoning to prevent warping and is not durable. halndies, and butcher's blocks. Veneer is used for fruit and vegetable baskets. The tupelo group includes four species belonging to the genus Nyssa. known as sour tupelo, gopher plum, tupelo, and ogeechee plum. swamps and along the edges of streams and ponds in the southeastern United States. and it is likely that the cut from these areas is largely black tupelo. ., )d from buttressed trees is used as floats for fish nets. lack walnut (Juglans nigra) is also known as American black walnut. Plains and southward into the riedmont Plateau, northern Louisiana, and Texas. naIrrPo-, while in on:n-grown trees it may be as much as 3 inches in waidth. 1. s E. d resistance to shock. Black walnut wood finishes especially 1.11.
for f'od, prnci:.pa~Ly in candy making and also in tre.ads and cakker. names apply is not well established. Delta from Louisiana to southern Aissouri and Illinois. called white poplar or whitewood. relatively large amounts of lumber from this species.
.;1 alter -ar :ning is completed. LThe :od is ,)t durable under c nditi n"
second-,ro:..th yellow-pa lar produced wood heavy enough for gunstck ,r duction. crates are made from louer-grade stock not suitable for more exacting uses. : In fr puljpr;od, excelsior, and c1K-co erag s o-.ves. stands .re inaccessible ocecause of rou,:h terrain aind lack -f roads. and ":eilow cyTress (inland type)" are frequently used. that of cedars but less than that of southern pine. that have been attacked by a fungus. Such wood is known as "pecky" cypress. not important and watertightness is unnecessary. members in docks, warehouses, factories, b ridges, and heavy construction. pi-.in,'7 shingles, cooperage, and fence posts. Douglas spruce., yellow fir, and Oregon pine. percent from California, and about 6 percent from Idaho and Montana. .nd caused ::: difticul : bcase of weakness of 'b.ond in rc. ruae is a lid Then material of high strength for structural uses is desired. sumierwiood Lnd rate of growth. go into fuel, railway ties, cooperage stock, mine timbers, and fencing. sash, doors, general millwork, railroad-car construction, boxes, and crates. in the Aipalachian mountainss of Virginia, North Carolina, and Tennessee. northeastern Oregon, and alon- the coast from dashington to northern California. southwestern Oregon and northern and eastern California. apperance in all of the species. co:m:pressive strength, moderately limber, soft, and low in resistance to shock. The other true firs are somewhat similar in weight and mechanical properties. except grand fir, have somewhat higher strength properties than balsam fir. durability when subject to conditions favorable to decay. wiashington, which states accounted for about half of the production in 1947.
and exacting uses for noble fir are for venetian blinds and ladder rails. subflooring, and sheathing. A considerable amount goes into boxes and crates. All of the true firs can be used in the manufacture of various grades of paper. Lake States. Other names are Canadian hemlock and hemlock spruce. between the New England States, the Middle Atlantic States, and the Lake States. North Carolina, South Carolina, and Virginia also produced considerable amounts. uloca contains 10 to i3 percent tannin. western hemlock fir, Prince Albert fir, gray fir, silver fir, and Alas pine. often found in the lumber are caused by hemlock bark maggots. hi, 1 annin content, ranging from 12 to 22 percent. for refrigerators, furniture, and ladders. from California and the balance from Oregon. Incunse-codar is used principally for lumber, fence posts, and ties. ot uran, softness and ease of cutting. So-:e is used for chests and toys. are poles, grape stakes, and split shingles. Hontana and one-third in Oregon and Washington. grade material is manufactured into interior finish, flooring, sash, and doors. evuuth pine, and soft pine. Lumber production of eastern white pine is confined principally to the. 1. "ntic and South Atlantic States. iinjl,. It turns considerably darker on exposure. Growth rings are distinct. lace. It is also easy to work and can be readily glued. foot. It is moderately soft, moderately weak, and low in resistance to shock. The heart'))od is rated ias intermediate in decay resistance. grades, ,s mt boxe;. ih-grade lumber goes into patterns for castings. boxes, s:1i1e and ma: rollers, t oys, and dairy and poultry supplies. re--d ,ine and eastern white pine. rated as intermediate in durability. uses include railway ties, mine timber, cslack cooer -,e, poles, and posts. straicht-,nine d with arrw cro-:th rings. reosisLtan. It is not considered durable under conditi ns favora. Ie to decay. soft pine, western pine, California white pine, bull pine, and black jack. South ocky i mountain region. light reddish brown, and the vide sapwood is nearly white to pale yellow. Growth rings are generally distinct ;ien not exceedingly narrow. region of greater rainfall, is harder and less uniform in texture. blinds, moldings, paneling, mantels, trim, and built-in cases and cabinets. joists, studs, and rafters. Knotty ponderosa pine is used for interior finish. ew ngland State :ew York, Pennsylvania, and tho Lake States. In the ari. 2 .hr n A1. : adu Sun.Pri: )d is distinct in th< a. rias. :. .:.rk, and boxes and crates. L :isiana into eastern Texas. tI.ountains is near the southern Tennessee border. sap pine, and shortleaf pine. over a billion board feet. appearance. The sapwood is yellowish white, and the heartwood is reddish brown. of a band of dark-colored summerwood and a band of light-colored springwood. may exist in the same tree. certain visual characteristics for structural timbers. Heartwood of the southern yellow pines is intermediate in durability. Sapwood is lacking in durability but can be readily treated with preservatives. shrinkage but stay in place well when properly seasoned. making vrapping paper and pulp board. 1: :te Ln ability to resist decay. pieces, ic ically free from defects. amount i" -. .nchin' ., :1. i unts :ere cut in on t 'in. and Or. -n. dried., and stays in place well after seasoning. white pine is used in the manufacture of matches. Gulf Coast and at the higher elevations in the Appalachian Mountain Range. limited area in the South litlantic and Gulf Coastal Plains. to rather small areas in Tennessee and Kentucky. is usually straight, except where deflected by knots, which are numerous. Eastern redcedar is very resistant to decay. The greatest quantity of eastern redcedar is used for fence posts. reacodar is used for the same purposes as eastern redcedar. followed by Oregon, Idaho, and Montana. sapwood is nearl white. SapYwod is narrow, often not over 1 inch in width. kiln drying but stays in place well if properly seasoned. wht lo er in density and roil ted Ptren-th pro'eorties thnn old--rowth trr*s.
t:nks, silts, caskets, :irood-stave pipe, and outdoor furniture. rcru rizona spruce, silver spruce, and balsam. I4.untain St tes and Orron.
. .all .hria: e. The lumber contains small knots. straction in the form of dimension stock, flooring, sheathing, and studding. Washington, and one-third from Oregon. Small amounts are produced in California. Sitka spruce is used principally for lumber, paper pulp, and cooperage. struction. Otlhr specialty uses are ladder rails and sounding boards for pianos. s uthern ;hit-cedr, swamp cedar, and boat cedur. wa ,-ar ai n: the Gulf coast to Lo~ulsiana. It i- strictly a swamp tree. durability is needed as in tanks and boats, and for woodenware. lopec f the Coast Range. in weight, averaging 29 pounds -er cubic foot at 12-percent mnoisture content. finish, furniture, and boat building. southern Alaska and British Columbia. is narrow, white to yellowish, and hardly distinguishable from the heartwood. resistant to decay. The wood has a mild, unpleasant odor. boats, cabinet work, and novelties. wtrah LANch WraNHnTI MWN DAA HICKORY'.